IT's a little tricky to duck a big name when you're in a field as talented as the 2009 U.S. Open 9-Ball Championship. It never hurts to draw a long shot in the first round, just to get comfortable and loosen up the elbow. But this past fall, Danny Harriman and Charlie Williams matched up in one of the more competitive matches in the early stages of the Chesapeake championship. The two never strayed too far from one another, reaching ties at three, six and eight games. Williams dropped the 9 to go up, 9-8, but then came up empty on this next break. 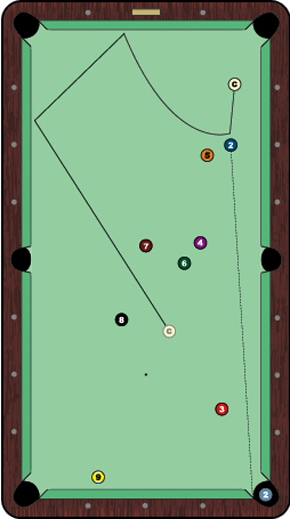 Harriman then opted to play aggressively, pocketing the 1 and going three rails for the position on the 2 ball shown in the diagram. The cue ball was just inches away from straight-in on the 2, but the 3 ball was on the other side of the table. Without a clear route across the table, Harriman played this terrific draw stroke shot. With plenty of power and a little left English, he drilled the 2 ball in the bottom left pocket. The cue ball skidded across the table for a few inches before the backspin pulled it up to the head rail. From there, it went off the long rail before splitting the 7 and 8 balls en route to perfect position for the 3. The beauty of this shot is the perfect mix of power and control. Hit the cue ball too softly, and it would draw back toward the head rail too quickly. Hit it with too much gusto, and the cue ball would roll across the table instead of heading along a path locked in on the 3 ball. Harriman cleared the rest of the rack to tie the match, 9-9. But Williams took the next two to advance, 11-9. For all his brilliance, Harriman was then eliminated by Thorsten Hohmann two matches later.